Two years after an earthquake devastated the Italian mountain city of L’Aquila, six scientists and a senior official are go to on trial accused of failing to issue adequate warnings about the catastrophe. The trial – due to start Tuesday – has proved intensely controversial before it has even begun, with the scientific community arguing that it is impossible to accurately predict the timing and severity of a quake. But relatives of the 309 people who died when centuries-old buildings and modern apartment blocks crumpled on the night of April 6 say they are not blaming the experts for failing to forecast the event, just for fostering a culture of complacency which cost lives. Prosecutors say the six leading scientists and a top official should have given much clearer warnings to the people of L’Aquila that the city had been the subject of more than 400 low-magnitude tremors and that there was a real danger of a major quake. They say clearer information would have allowed the inhabitants of the city, the capital of the Abruzzo region, to evaluate the threat and decide whether to evacuate their homes. The experts were members of a panel that met six days before the 6.3 magnitude earthquake at which they determined that the activity was probably not a prelude to a big quake. They include some of Italy’s most respected geophysicists, including Enzo Boschi, the then president of the National Institute of Geophysics and Volcanology, Giulio Selvaggi, the director of the National Earthquake Centre in Rome; and Claudio Eva, a physics professor at the University of Genoa. Their defenders say that like any group of scientists asked to predict a quake, they faced an acute quandary â€“ if they had been too alarmist they would have needlessly prompted the evacuation of a large city; being too cautious risked putting tens of thousands of lives at risk. 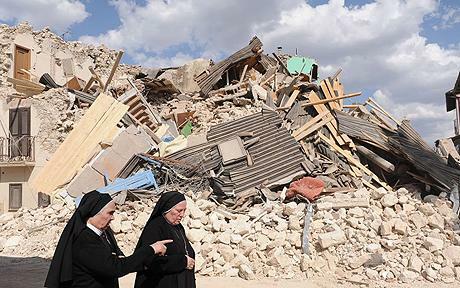 The scientific community has leapt to the defence of the experts, saying that current technology does not allow the prediction of quakes and that the scientists are being unfairly made scapegoats of the calamity, which reduced L’Aquila’s medieval centre to rubble and left more than 60,000 people homeless. More than 5,000 scientists sent an open letter sent to Giorgio Napolitano, Italy’s president, criticising the trial of their colleagues. The American Association for the Advancement of Science said it was “unfair and naive” of magistrates to charge the men for failing “to alert the population of L’Aquila of an impending earthquake”. Thomas Jordan, the American chairman of the International Commission on Earthquake Forecasting, said the charges against the scientists have “no merit”. “This is a trial which opens on very shaky foundations. You cannot put science on trial,” said Alfredo Biondi, the lawyer for Prof Eva, one of the defendants. He said that during the meeting of the expert panel his client had stated that “one cannot rule out a major quake”. But critics said the experts should have at the very least warned L’Aquila’s population of the fragility of many of the city’s centuries-old buildings and reminded them of standard earthquake drills in such a seismically active zone. The slow pace of Italian justice means that the trial is likely to drag on for months, if not years. But if they are convicted, the seven defendants could face up to 15 years in prison.